Andrew Rossow is an Associate Attorney at Gregory M. Gantt Co. LPA where, in addition to their general practice, Drew’s passion lies in the areas of Cyberspace Law and Intellectual Property Law. He is a native from Dallas, Texas and a graduate from The University of Dayton School of Law. He received his Bachelor’s from Hofstra University’s Zarb School of Business in Hempstead, New York. Drew is also a contributor for The Huffington Post and writes on several different areas in cyberspace and technology law. 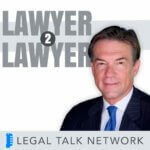 Maria Z. Vathis and Andrew Rossow discuss cyberbullying, the impact on victims, and the efforts by the legal profession to prevent cyberbullying. Drew Rossow and Ben Meiselas discuss the Equifax data breach, what went wrong, litigation, the potential impact, and what customers need to do. Drew Rossow and Elan Fields discuss their millennial perspective of the legal industry.